Oh yeah! I went there. The new Cricut Circle cartridge is out, and there appears to be a lot of hub bub about the word Jerk being on it. So, I decided to use it on a project. And I think it’s cute! One of Hartly’s favorite birthday gifts was her bouquet of balloons. She ran and ran around the house with them tightly gripped in her hand trailing behind her. But the best part was her jerking the string holding them together and watching her squeal with delight as they floated up to the ceiling. It’s a good thing her Daddy is so tall, because I think he spent an afternoon pulling them off the ceiling. 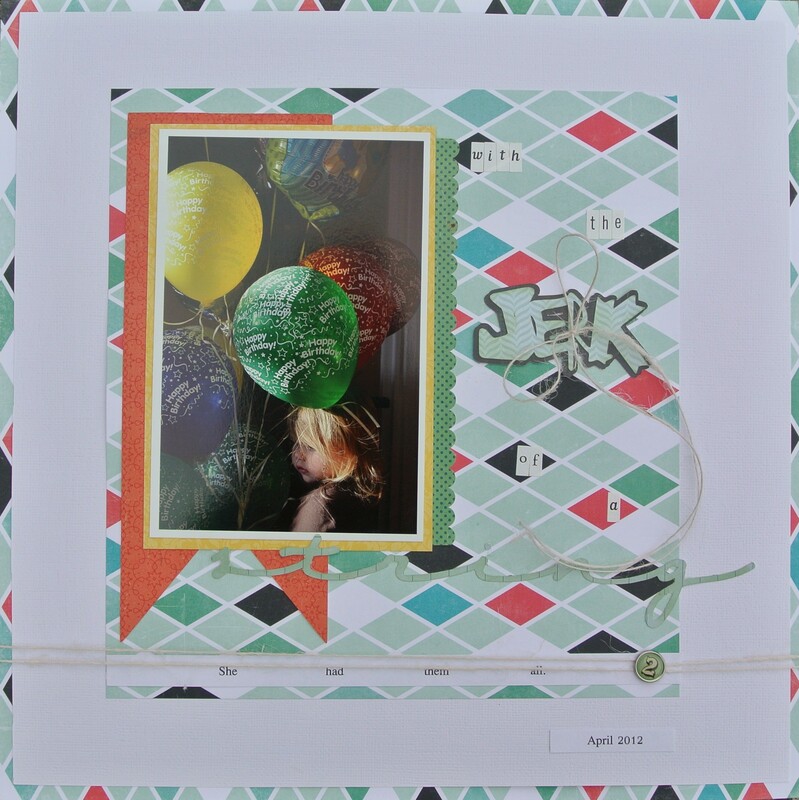 I used the Studio Calico Story Hour kit as the colors played off the colors of the birthday balloons. My cuts are from Out of Character for the word jerk cut at 2.5″, Birtday Bash for the pennant layer and Opposites Attract for the word string. My last two cuts were cut to the size of my scrap paper. I’m still Stretching my Kit and using even the tinest of my scraps. Yippee! 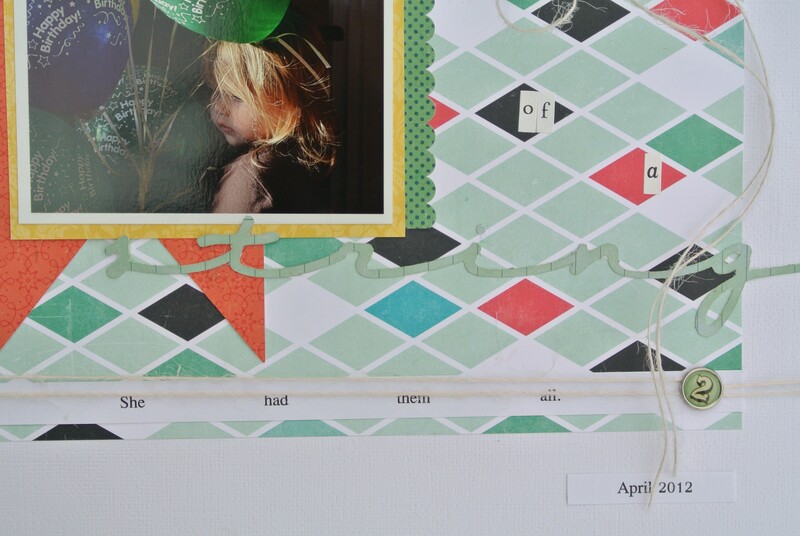 I plan to use this layout for the Circle Weekly Challenge: Birthday Challenge in which you needed to use string on your layout. And really how can you have a layout about string without string? Love it Sara! You have so inspired me to make more layouts! thank you these are such precious memories. Love the story and the usage of “the word”! LOL. 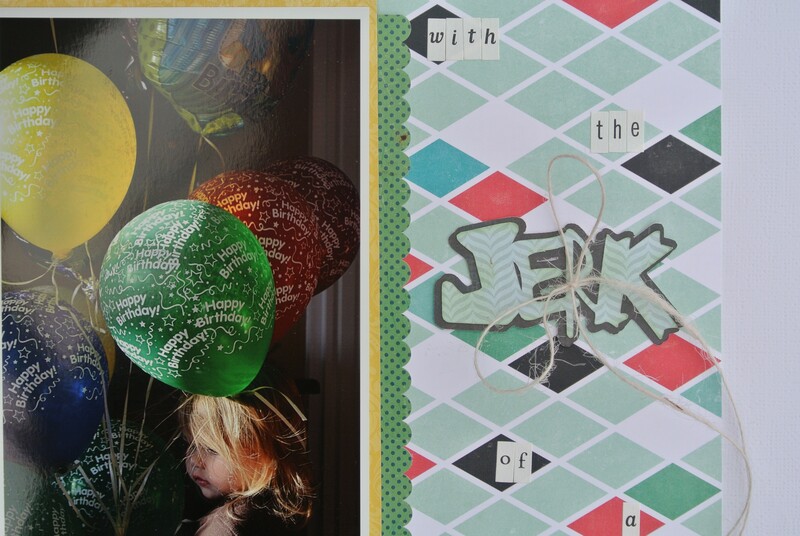 Sara this is a great and clever way to use Jerk on a card or layout. I just love it. Thanks so much for sharing your awesome work. Super creative! The layout is adorable! How wonderful! Love your string lo! Way to go using the new cart, too. Sooooo cute. Love how you did the layout and think it’s perfect way to use the word “jerk”. What a fun memory of your little one. Very creative, your layout is adorable!